~~Can you guys also comment on this post, on who you want me to feature on the next Artistes of the Month? Thank you. I haven't been watching any series and I don't know who should I feature. Thanks for the help. Happy Birthday Maggie jie!! Maggie Cheung Hor Yee, was one of my old time favorite actress!! My idol before Bernice Liu came along. I grew up watching TVB series and all I know is Maggie Cheung and all the old time Dong Ka Fa Dans. [Like Jessica Hsuan, Kenix Kwok, Flora Chan, Esther Kwan, Ada Choi, Melissa Ng, Maggie Cheung, etc..] So basically I grew up watching them. ;] But as a child, I never had any interest in TVB. I would just watch them when ever my family was watching TV. But around 2006-2007, I grew to love TVB and Bernice Liu became my idol. I was around 13/14 then. I kinda didn't really know who to choose for February's/March's Artist of the Month. 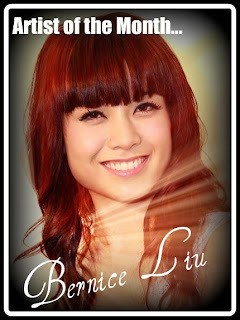 So, I ended up choosing my all time favorite IDOL in the whole wide world... Bernice Liu!! I don't care about how many news and rumors she has now, I will STILL Support HER forever!!! Bernice Liu was born on January 6th, 1979. She has two siblings, where Bernice is the Middle Child. Bernice joint Miss Chinese Vancouver Pageant due to encouragement/recommendation from friends and that her Major at that time required her to be bilingual. To her surprise, she was the one who won the crown that night. She then attend Miss Chinese International Pageant representing Vancouver. Bernice once again took home the crown. First she was going to turn down her contract with TVB, but due to supports and encouragement from families and friends she decided to sign with TVB. Today Bernice is one of TVB Fadans and high pay actress. To get to this point, Bernice never give up and she worked her best to achieve what she is today. Bernice filmed over 20 series with TVB and 8 movies. Bernice also sung over 11 songs. Bernice is thinking about releasing an album and sign into the music industry. I personally doesn't like when artistes sign into the music industry, but no matter what, I'll always support them! So if Bernice ever release her album, I'll definitely buy it. =) Bernice was then cast into her first role in 2001 right after she enter TVB. Her role as Princess Sam-Tin in the Sitcom Virtues of Harmony led to her recognizance. The role eventually gave her the nickname "Princess" among friends, fans, and the media. Bernice was then cast into many other series, and continued to work hard and finally achieve to be what she is today. During her two pageants, Bernice had won both the MCI and Miss Vancouver crown. Other than those titles, Bernice had also toke home the Miss Photogenic and Miss Cosmopolitan and Miss Talents awards. Past these years, Bernice has received over 24 awards. In 2007, Bernice was hot favorite to win the Most Improve Actress award hosted by TVB. But Bernice lost the award to Niki Chow. Yesterday, there was a costume fitting for the new TVB series ‘Sneak Attack’. Actors include Michael Tse playing ‘Laughing’, Bosco Wong, Fala Chan, Kate Tsui and Damian Lau also attended this event. Damian smiled: “I have been away from TVB for a whole year. I am fortunate to return and participate in a series with Laughing” He thanks Michael for bringing him this opportunity which made Michael look slightly embarrassed. Other news, the broadcasting commission received 2 complaints about TVB ‘The Rippling Blossom’ as it showed in the storyline, eating rare part of the tuna is bad influence for children as well as for the environment. News update: Kelly Chen had a Miscarriage? Since giving birth to her son, Chace, in 2009,Kelly wanted to have a daughter. To fulfill this dream, 38-year-old Kelly underwent in-vitro fertilization to conceive. At the end of January, Kelly announced becoming successfully pregnant with twins. Despite her excitement, she admitted that she worried about the stability of her pregnancy. In her fifth month, Kelly announced her miscarriage yesterday. Thoughts: Aww... this is such a sad news. At the end, her twins daughters can't make it into the world. My condolences goes out to Kelly and her family. Kelly must be in her toughest time now. Despite what age you are, having a miscarriage is a devastating thing to anyone. I just hope that Kelly and her family can quickly be heal from this tragedy and move on. I will always Support Kelly!! I also hope that Kelly can quickly recover and stay strong. Everything the Best for Kelly and her family!